Greetings from sunny Sharjah! I’m attending the Sharjah Book Fair and 3rd annual ALA Conference. The Sharjah Book Fair drew 2.3 million attendees this year and the ALA conference drew 350 attendees. Wednesday morning I got to meet Julie Todaro, ALA president, and she gave the keynote opening the conference on the Libraries Transform initiative. After Dr. Todaro’s keynote, I presented a session on technology trends which was very well attended, with about 100 participants. I attended a combined session called Trends in Academic Librarianship: Perspectives from the Gulf, which featured the research of academic librarians from around the region. The first session was presented by Christine Furno, Reference and Instruction Librarian and Rhonda Stricklett, Information Literacy Librarian, both at American University of Sharjah. They spoke about outreach services to undergraduate writing students and their experiences had a lot in common with Stony Brook’s (even down to their required Writing 102 course!) Like us, they also partner with their writing center to offer combined services. They embed a librarian in the writing center, which shares their building, so that writing center tutors can refer students to librarians when they need research assistance. They are in the process of conducting a study with their lower and upper division students around the types of reference services that the library is offering in the writing center. Their preliminary findings confirm that there is a huge variety in knowledge, especially between lower and upper division students. The second presentation was from Beth Daniel Lindsay, Access and Public Services Librarian at New York University-Abu Dhabi who spoke about creating student advisory committees. The last session was presented by Reya Saliba, Information Service Specialist at Weill Cornell Medicine, Qatar. The library at Weill Cornell Medicine, Qatar was integrated into the ESL instruction in their aspiring doctor program, which is a bridge program for future medical student applicants. Information literacy courses were integrated into the material with a flipped classroom model and online content is hosted in Canvas. In the afternoon, I attended Research Writing and Research Impact Measures: What Librarians Need to Know with Dr. Saif Al Jabri, Director of Information Center, Sultan Qaboos University (SQU), Oman and Dr. J. K. Vijayakumar, Interim Library Director, King Abdullah University of Science and Technology (KAUST), Saudi Arabia. They discussed research metrics and output from Gulf Cooperation Council institutions and creating a practice for doing research. On Thursday, we opened with a keynote from Miguel Figueroa, Director of the ALA Center for the Future of Libraries. Miguel spoke about the ways libraries around the country and world are using technology and outreach to connect with new users and groups. After that, I attended Academic Libraries and Student Success: Lessons from the Assessment in Action Project presented by Kara Malenfant, ALA’s Senior Strategist for Special Initiatives, Association of College and Research Libraries. Kara examined the ways academic libraries approach assessment and advocated for initiatives that go beyond numbers and figures to demonstrate true value for their communities. This ties very strongly into the work we have been doing with the data dashboard at Stony Brook; truly effective initiatives turn data into a story that connects hard numbers to value for administrators, stakeholders, and patrons. Kara described a grant initiative that ACRL has been involved in that supported assessment projects in a variety of different libraries. They have released two free reports that detail these projects as well as a book. The last session I attended was Julie Todaro talking about Integrating Continuous Learning with Work. Professional development is such an important task for librarians as technologies and institutions evolve, but creating professional development activities that work for all learners is a challenge. Luckily, education opportunities have also evolved and these developments enable professionals and organizations to better plan and schedule learning. Dr. Todaro developed a workbook for this integration that is pure gold and I can’t wait to go back to it at Stony Brook. I’ll link to it here when it’s posted. 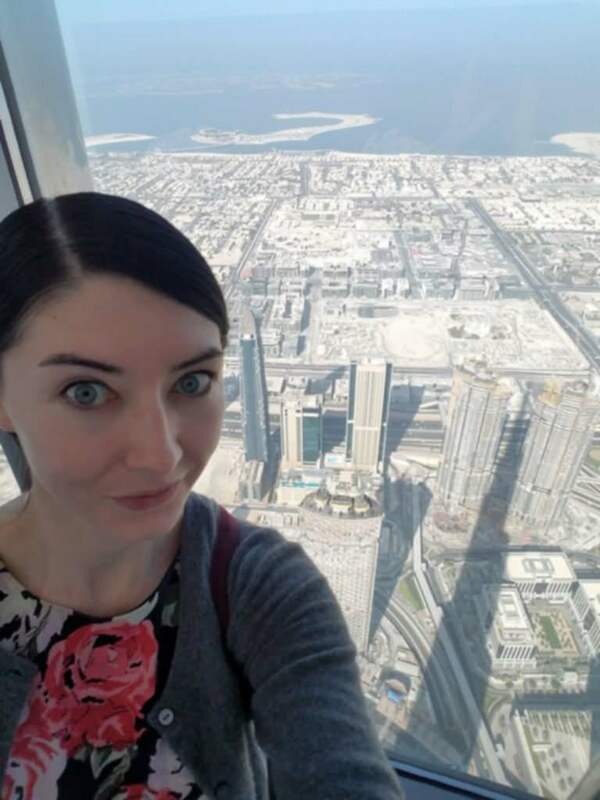 On Friday I had a little time for touristing, so I visited the Burj Khalifa in Dubai! Here’s a pic from the 148th floor with the shadow of the building. It was incredible! Sharjah and the Book Fair were fantastic and I had a wonderful time! It was great to meet so many librarians from the Gulf and from around the world and connect over our shared hopes for the future. A big thank you to ALA and the Sharjah Book Fair for hosting my attendance at this event. This entry was posted in Presentation, Travel. Bookmark the permalink.